Oxy99 Pure Oxygen Is A Lightweight Portable Can Developed By Ing. L. & A. Boschi Of Italy (Since 1930). Oxygen For Personal Use Comes Packaged In A 500 Ml Oxy99 Can Comprising Of 6 Liters Of Oxygen. Now The World Has Got Easy Access To Pure Natural Oxygen. Oxy99 Can Fitted With Ergonomically Built-In Mask And Trigger System For Easy Inhalation. 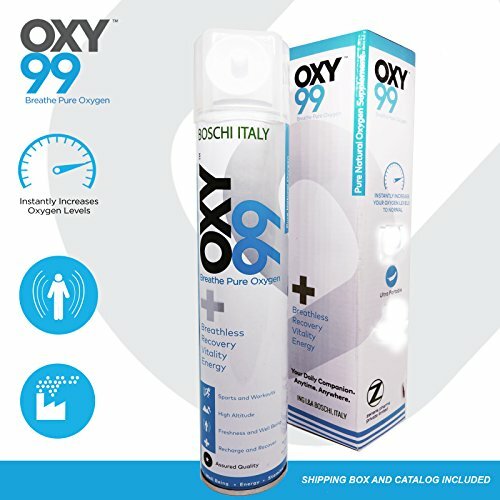 Oxy99 Instantly Increases Oxygen Levels In The Body And Helps Restore Brain And Body Functions To Normal. It Is Safe And Easy To Use Certified Oxygen In A Can. By Inhaling Just 5 To 6 Short Bursts, It Helps Through Conditions Resulting From Low Oxygen Levels In The Body. Useful For Sports Recovery, Breathlessness Due To Respiratory, Pollution, And Altitude & First Aid Is Life Saver. You Suffer From Lung Or Respiratory Disorders Such As Asthma, C.O.P.D, Etc. Helps You Recover From Breathlessness & Suffocation Caused By Pollution, Smoking, Stale Air, Poorly Ventilated Rooms, High Altitude, Etc.